When you get an email saying that you have to be ready in two hours because a reporter backed out from riding in a McLaren around the Detroit Belle Isle Grand Prix track and there's a last-minute opening, you jump on it. So that's exactly what I did on Thursday. 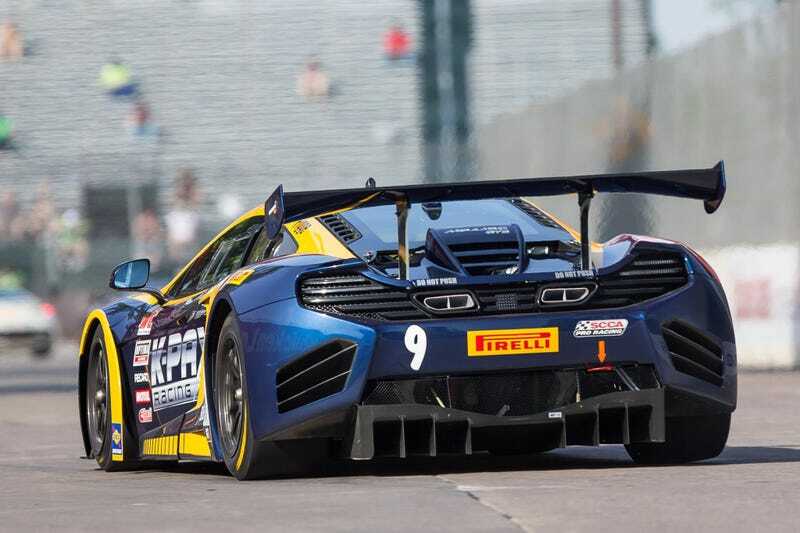 K-PAX Racing invited a few of us for ridealongs in the McLaren 12C GT3 around Belle Isle's 13-turn, 2.35-mile track. (Full disclosure: I had a can of Sprite before we drove.) Us journalists were driven by drivers Alex Figge and Robert Thorne. I had Thorne. It's like a beautiful piece of art... well, one operated with paddle shifters. I'll be honest, I felt like our drivers took it easy on us since we were pretty much civilians, but it doesn't mean we still weren't going balls-out fast either. Listen to the glorious sound of the engine below right before another sprint. Big thanks to K-PAX and another big thanks to Steve Pham for getting me the video file! Top photo via K-PAX.